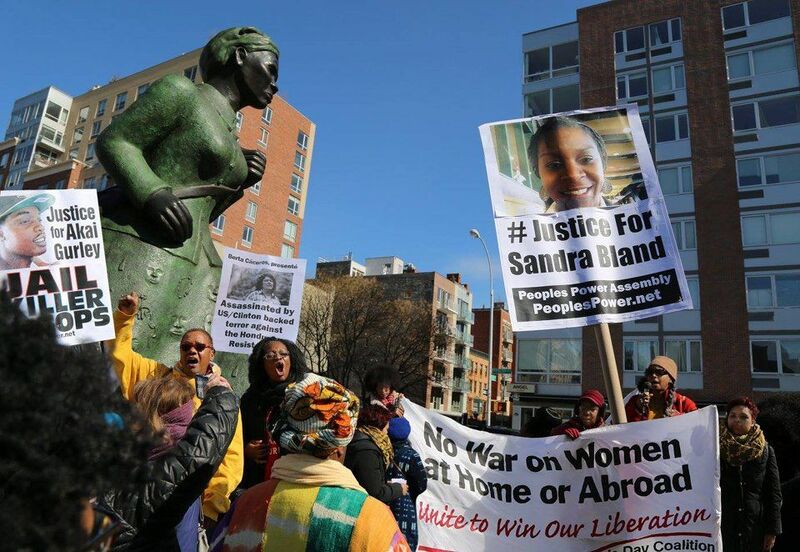 Home » Coast to coast » Women rally for justice, liberation in Harlem, N.Y.
Women rally for justice, liberation in Harlem, N.Y. Celebrating International Women’s Day in Harlem, N.Y. at a statue of Harriet Tubman, the amazing Civil War hero who helped hundreds escape slavery. They then marched to spotlight the many issues women face today. The International Working Women’s Day Coalition held its 11th annual march and rally in Harlem, N.Y., on March 5 with the political theme “Stop the War on Women: Stand Together and Organize an Independent Fightback.” The gathering of women and their allies began at the base of the Harriet Tubman statue on St. Nicholas Avenue to symbolize the ongoing resistance that women have been in the forefront of against all forms of class oppression, including racism and sexism, for many generations. The protest reflected the “Can We Live?” 10-point IWWDC program, which brings home the reality that every issue is a woman’s issue. 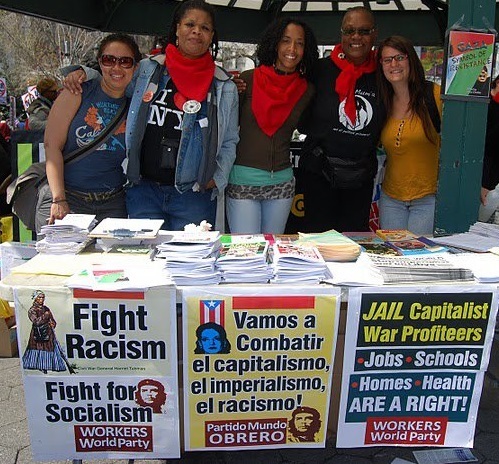 The program includes the basic human rights to health care, housing, education, childcare, union jobs and/or livable income with full benefits, food, reproductive justice, and a clean environment in a world free from racism, sexism, homophobia, police brutality, sexual violence, militarism and occupation. Many of the signs, banners and powerful talks reflected a clear anti-capitalist and anti-imperialist message, in opposition to relying on the upcoming elections to bring about any fundamental change. Speakers at the opening rally included Hertensia Petersen, the aunt of Akai Gurley, a 23-year-old Black man killed by New York police in 2014; Marylin Zuniga, a heroic teacher illegally fired from her job for allowing her third-grade students to write get-well cards to political prisoner Mumia Abu-Jamal; Brenda Stokely, IWWDC co-coordinator; and Monica Moorehead from the International Women’s Alliance and 2016 Workers World Party presidential candidate. Cultural presentations were given by Ruth Simmons along with Picture the Homeless advocates DeBorah Dickerson, Arvernetta Henry and Maria Walles. 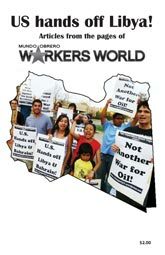 The rally was chaired by Vijou Bryant from Gabriela USA, a Filipino women’s group. All along the march route throughout the Harlem community, stops were made at different spots representing various struggles, including a low-wage McDonalds; an Armed Forces recruitment station; the Grant Houses public housing project; a welfare office; the Harlem Zone Charter School; and the Metro North train station, a site of police raids of homeless people. Speakers included Josephine Perez of the People’s Power Assembly and TransJustice; Charmel Hudson, Darlene Bryant and Jazmin B. from Picture The Homeless; May Madarang, Gabriela; Archer Sackey, the Revolutionary Student Coordinating Committee; Oneisha Portlet, the Transit Workers Union; Monique Mojica, Anakbayan New York Women’s Committee; Everin, Bronx United in the Struggle; Florence Rice, a 97-year-old Harlem housing activist; and Karen Abraham, Students without Borders. A solidarity statement from Laundry Workers Center activist Rosanna Rodríguez was read by Teresa Gutierrez from the May 1st Coalition for Worker and Immigrant Rights. 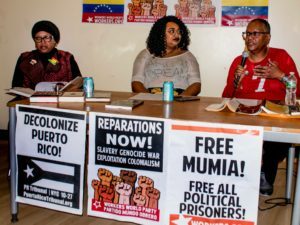 Following the march, a delegation of some of these same activists attended the “Celebrating Puerto Rican Women: Today, Tomorrow and Always!” program in East Harlem, which honored activists Esperanza Martell, Amanda Matos and the late Sandra Hernandez.